This Large Commercial Grade Powerful Ultrasonic Cleaner has 10 sets of powerful transducers, efficient heater and large tank capacity for superior cleaning results, making it great for professional cleaning. 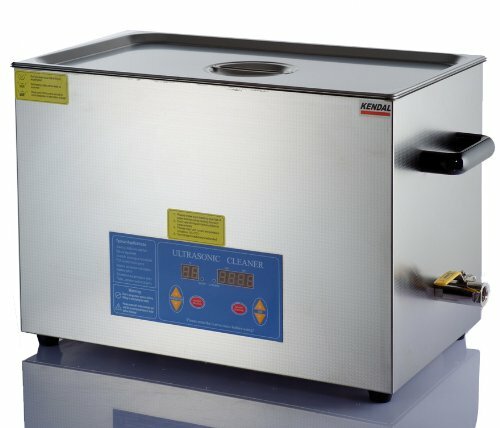 The timer and temperature controller in the ultrasonic cleaner to control the unit, according to the quantity and condition of the items to be cleaned to choose a working time and set a temperature. As a result, it is more convenient and the cleaning results are more remarkable! 10 x strengthened transducers make the ultrasonic more powerful (42 KHz and 600 Watts ultrasonic cleaning power) and provides remarkable cleaning results. Large tank -- Suitable for long and large items. Tank Size: 19.50" (L) x 11.50" (W) x 7.75" (H). Tank working Capacity: 27 Liter (7.13 gallon). Heater -- Powerful heater (300 watts) makes the temperature reach the presetting one quickly. Digital temperature control with temperature ranging from 20 to 80 degree in Celsius (68 to 176 degree Fahrenheit). The LED digital display also shows real time temperature. ALL STAINLESS Construction (body, tank, cover and mesh basket) -- Anti-Acid and Alkaline, resists damage from chemical spills. Drains with flow control valve for easy cleaning and rinsing. Digital program cleaning cycles ranging from 1 to 99 minutes--easy to operate. Basket is included.